Sublime yet horrific, The Enclave (2013) is a film installation and photographic series, first shown at last year's Venice Biennale and expanded here, in the depths of this Soho car park. Presented by the gallery Edel Assanti and the Vinyl Factory, it's a genuinely shocking work, shot in the eastern Congo, which has witnessed an apocalypse in which 5.4 million people have died due to war since 1998. Mosse, who's shortlisted for the Deutsche Börse Prize, ventured deep into this dramatic landscape, and shot both the film and photographs on a now-obsolete US military-devised film stock which is able to capture infrared light, and thus detect camouflaged soldiers from the air. The film turns anything green a deep pink and the effect is to lend Mosse's very real and often deeply unsettling footage an almost dreamlike, Technicolor hue. 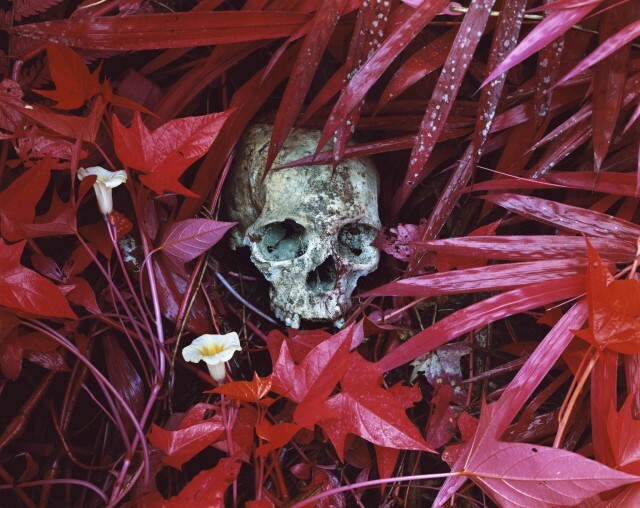 The photographs reflect the beauty and horror he encountered - a skull next to a lily is an emblem of the tense balance in the work. But in the film, Mosse pulls you viscerally into the nightmare he witnessed. Largely shot on Steadicam and staged on eight screens, it forces you to constantly chase the film, just as Mosse pursued his story. Several sequences are grandly cinematic - a descent into a refugee camp is both soaring and gut-wrenching, as is a sequence in which the camera sits almost on the shoulder of bazooka-laden militia. Among the best pieces of video art I've seen, The Enclave at once exhilarates and devastates.